DAWN OF THE DEAD is the 2004 directorial debut by Zack Snyder (300,Watchmen, Sucker Punch, Superman: Man of Steel). It is a remake of George A. Romero's 1978 film of the same name. 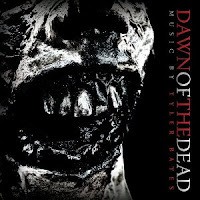 One of the few zombie films to make over hundred million dollars at the international box office, Dawn of The Dead introduced movie fans to two new talents: its director, Zack Snyder and its composer Tyler Bates. Coming from the rock scene of Chicago, Tyler Bates has established himself as one of the leading composer in Hollywood scoring films such as 300, Watchmen, Rob Zombie's Halloweens,Sucker Punch, The Way, Californication and many, many more. 5/5 Finally this gets a cd release after the film was a box office hit, journey back to the dawn of the dead and help get visualized with the release by Tyler Bates.